On 30 January 1889, the dead bodies of Crown Prince Rudolph of Austria and his lover, Baroness Maria Vetsera, were discovered in the Imperial hunting lodge at Mayerling. The official version is that Rudolf killed Maria in a suicide pact before taking his own life. But, another, more sinister theory suggests that the two lovers were murdered by political enemies. Personally, I believe the assassination theory. The suicide pact has always seemed too simple an explanation to me. Plenty of royals, even married ones, have found ways to be with the women they loved. So, was suicide really necessary? It’s also true though, that as Rudolph used drugs and probably suffered from bouts of depression, he may have thought there was no other way for him to be with Maria bar in death. Depression twists our perception of things and can make any situation seem utterly hopeless and any problem without solution. Self-medication with drugs just makes things so much worse. I doubt we’ll ever know for sure what happened, unless new evidence should be discovered in the future. 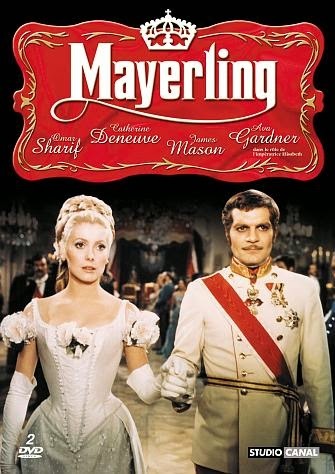 This post, though, is not about my thoughts about Rudolph’s death, but on the 1968 movie inspired by the events at Mayerling. The movie espouses the suicide pact theory. 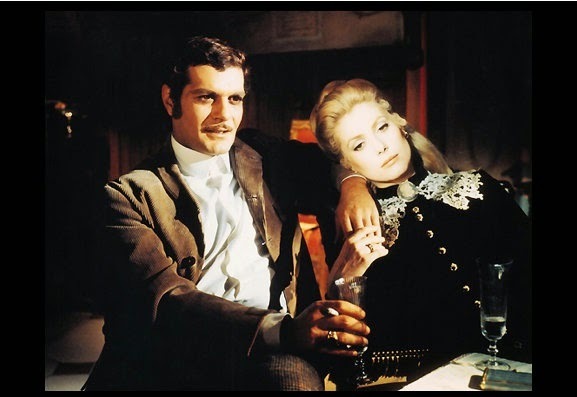 Rudolph (played by Omar Sharif), kept away by his father from any real position of power for his liberal ideas and thwarted in his desire to be with Maria (Catherine Denevue), becomes so depressed that he decides to take his own life. Maria, who doesn’t want to live without him, asks him to kill her too. Although Sharif and Denevue are both great actors, they lack chemistry. There is so little spark between them that you can hardly believe they are madly in love with each other. Of course, this could have been intentional. This story is more about despair than passion, but still, I’d have loved to see more of the latter at least in the initial stages of their relationship, before the obstacles in their path seemed so large and indomitable to destroy all their hopes and lead them, ultimately, to their deaths. The lack of emotions permeates the entire movie though. 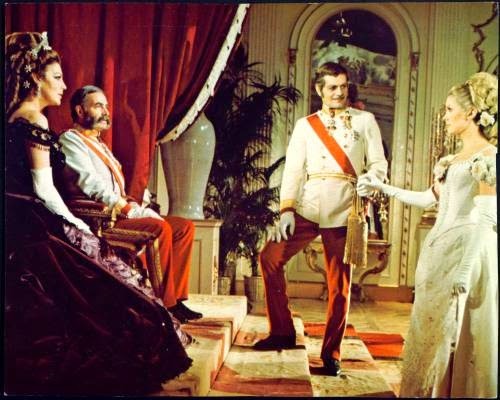 The cast is full of brilliant actors – James Mason plays the Emperor Franz Josef, Ava Gardner the Empress Elizabeth, and James Robertson Justice the Prince of Wales – but their performances are quite cold and detached, even when away from the prying eyes of the court. Instead, the movie is a feast for the eyes. The costumes, settings, and music are absolutely stunning and show us the opulence and decadence of a world long gone. Just for that, this movie is well worth a watch.